was nominated and accepted the role or president. We appear to have settled into a routine that serves us well and reflects the commitment of our members. Our meetings continued to be held at Nobby Seymour’s studio, a most welcoming, cosy and intimate venue. had instigated some years before. calendar between our General Meetings. The linking of the two proved most successful. enhancement and maintenance of these heritage gardens. also celebrated our 30th anniversary and was hosted by Jill and John Hawker. that he hung on the High St fence in time for the Spring into Gardening event in October. hope that Council will allocate a larger stall in the future. will be lodging the required documentation in time for spring in the 2018-2019 year. meeting with Council staff who heard our objection to this use of the Victoria Gardens. one of the scheduled performances. pleasing to see that Council has improved the playground upgrade budget. Dogs on and off leash. heritage values and lawn and garden bed health of our wonderful gardens. community development activity in the gardens. opportunity to marvel at his creativity. more active role to continue the work we set out to undertake some 30 years ago. The 2016-2017 AGM was held on July 5th, 2016 and so began our 29th year since our inception in 1987. As required all office bearers stood down and members were called on to nominate the new committee. Denise Saville was nominated and accepted the position of secretary and public officer; Jill Hawker was nominated and accepted the position of treasurer and Vihra Migios was nominated and accepted the role or president. We appear to have settled into a routine that again serves us well and reflects the commitment of our members. Our meetings continued to be held at Nobby Seymour’s studio and it has proven to be a most welcoming, cosy and intimate venue. John Hawker produced 4 Newsletters and led the very successful May Inspection walk that he had instigated some years before. The FoVG meets 4 times a year and follows the financial year calendar that is required of an incorporated body. The date of each meeting is notified some weeks before and is also foreshadowed in the minutes. The 2015-2016 AGM in July was followed with general meeting in August, December and March. As usual these were well attended and a great many issues discussed. Members took turns to tend to our Spring into gardening Stall on October, and soon after followed this with our end of year party in the Gardens. We settled on the wording and graphic design of a small flyer and thank Nick Hawker for his excellent work. We also agreed to hold future AGMs and the first General Meeting for the year on the same date. This was because we found the 6-month lag between general meetings (interrupted by the AGM) meant that we could not keep track of the work we had set ourselves. See May 11 email to members for details. Amy Lee continued to investigate the Council’s intentions for the Lumley Playground and discovered that Stonnington Council’s scheduled playground upgrades was drawn up long before the demographic changes that were occurring in Prahran had been taken into consideration. One example of this is a small Prahran street with less than 50 residences (9 of which are 1 bedroom flats) and is now the home to 19 toddlers and babies, and more on the way! Unfortunately, we have yet to see a change in the upgrade schedule which, if followed, will mean that all these children will be far too old to enjoy the amenity. The May Inspection walk was again led by John Hawker and included 4 Council staff as well as FoVG members. See our Newsletters for a summary of improvements that continue to bear a direct link to our efforts in supporting the maintenance crews and gardeners in their work and the continued enhancement and maintenance of these heritage gardens. We sent a Submission to Council’s Draft 2017-2021 Plan and in May spoke at the meeting held to hear such submissions. Four of us attended this meeting, and despite being warned that only the president would be allowed to speak, member Amy Lee was granted permission to speak to the issues that pertained to the Lumley Playground. We were surprised to find that we were the only members of the Stonnington community who elected to speak to their submission. It was disappointing to see that Stonnington takes it for granted that the community does not engage and we questioned why this was accepted rather than questions raised as to how Council can generate community engagement. Copy of the submission and my speaker’s notes will be on the FoVG web site following the AGM and will also be available at the AGM. We intend to follow up by seeking Council’s response to our submission; to follow up on the suggestions we made for community engagement, and to continue to lobby for a timely upgrade to the Lumley Playground thus anticipating another busy year. We have yet to finalise discussion around the kind of signage we envisage that identifies the history and flora in the gardens. On behalf of the FoVG I would like to extend our sincere thanks to our secretary Denise Saville for the excellent way she manages to summarise our discussions; to treasurer Jill Hawker for keeping finances and membership lists up to date and for attending to the group emails she sends on our behalf. We would not be able to hold the Council to account for the management of the gardens without John Hawker’s extensive knowledge and expertise, and trust that you enjoy his informative newsletters. Nobby Seymour continues to be a most genial host and to give us an opportunity to marvel at his creativity. We welcome all the new members who joined us in 2016-17 and thank existing members for their continued support. Just knowing that you are there supports those of us who can take a more active role to continue the work we set out to undertake some 29 years ago. 2017 is the 30th Anniversary of the FoVG. And we thank all members past and present for their support and contributions. We also thank the Stonnington Council and staff for the work that has gone into the new watering system and the oval resurfacing. We trust that all our dog walking members encourage other dog walkers to keep their dogs off leash only on the oval to ensure that the garden beds and other lawns are not dug up and gardeners do not find doggy offerings! Our 2014-15 AGM was held on June 23rd 2015 and so began the 2015-2016 year with the election of office bearers. Jennifer Withcomb took on the task of acting treasurer until such time as we had a full time candidate to take it on. Jill Hawker very kindly stepped forward and was duly charged with the onerous task of maintaining our database, sending out reminders and accounting for the income received from members. As required all office bearers stood down and members were called on to nominate for a new committee. Denise Saville was nominated and accepted the position of secretary as did Jill Hawker in the role of treasurer and Vihra Migios in the role of president. Our meetings continued to be held at Nobby Seymour’s studio giving us the opportunity to view and marvel at elements of what was then his upcoming exhibition. John Hawker continued to produce the newsletters, and the three that were produced in 2015-16 are posted on the website. The FoVG meets 4 times per year following the financial year’s calendar and within the requirements of an incorporated body. The date of each meeting is notified some weeks before the meeting is to be held and is also foreshadowed in the minutes. The 2014-2015 AGM in June was followed with general meetings in August, December 2015 and March 2016. These were well attended and a great many issues discussed. Members took turns to tend the ‘Spring Into Gardening’ stall on October 11th. (December 2015 Newsletter). FoVG members recall that this event arose out of the FoVG ‘fete’ to raise funds for the refurbishment of the fountain. A small community led event has morphed into the “Spring into Gardening’ event held by Stonnington Council each year. We followed this with the Christmas Party on December 13th. We took the opportunity to enjoy the seating offered by the new RSL memorial space. Peter Legge once again took home the prize in the small photographic competition, and the challenge is now to all members to enter in December 2016, as Peter would like some more competition. Members followed up on a request for a meeting with a person concerned with the condition of the Malvern Gardens on High Street. Unfortunately there is no ‘friends of’ community group to oversee or lobby Council on behalf of this very important garden. Is there a role for Stonnington Council’s Community Development staff here? Stonnington Council oversees the building of large apartment blocks whilst at the same time acknowledging that Stonnington residents enjoy the second smallest public open space allocation in Melbourne. In the meanwhile, the existing gardens and playgrounds are being offered far less than optimum maintenance and improvements. The increasing number of apartments on what was once a single occupancy point to a rates revenue stream that has the potential to improve Council’s commitment to increase their budgetary allocation for existing gardens. Of particular more local interest is the request from a new member that we consider how to get improvements made to the Lumley playground. It appears that these playgrounds are scheduled for updates every 27 years, and given the schedule that applies to the Lumley playground, the babies and toddlers who live in the area will be teenagers by the time this is done. Given the increasing use of the gardens we also formed a small group to discuss ways we could ‘market’ FoVG membership and thus increase the potential to maintain our pro-active involvement in the care of the gardens. The two strategies developed will be tabled for the consideration of the members. Practical lobbying for such improvement has been part of the strategy of the May Gardens Inspection. Council has responded to the call for a clear path to the Lumley playground and has provided us with a plan for such. The leveling of the entrance to the toilet is now complete. The next newsletter will provide a more detailed summary of improvements that bear a direct link to our efforts in supporting the maintenance crews and gardeners in their work. On behalf of the FoVG I would like to extend our sincere thanks to our secretary Denise Saville, for her ability to follow what often feels like free wheeling discussion and to summarise the main points and decisions in the minutes. Our thanks also go to our treasurer, Jill Hawker, for the well-kept membership list and accounts, and for the group emails she sends on our behalf. We also thank John Hawker for the role he plays in producing the informative newsletters and his leadership in instigating and leading the May Gardens Inspection, a pro-active strategy that is yielding significant improvements. Our thanks also go to Nobby Seymour for being the most genial of hosts and for making his studio available for our meetings. Welcome to all new members and a reminder that we appreciate both those who simply join and add their names to our membership list, and that we have already enjoyed the enthusiasm and new ideas of those who are in a position to take a more active role. We began the July 2014-June 2015 year with the election of office bearers. The committee, comprising Denise Saville, Vihra Migios, was re-elected for a further 12 months and John Hawker continued to take responsibility for the Newsletter. However, despite Jennifer having put us on notice at the last AGM, we were unable to nominate a new Treasurer and Jennifer very kindly offered to take on the role of acting Treasurer pending another member stepping up to the plate (more on this later in the report). Our meetings continue to be held at Nobby Seymour’s studio in Bendigo St, a venue perfectly suited to a group such as the Friends. We have successfully aligned our meetings and memberships with the financial year and trust that the Direct Debit facility makes it easier to keep membership up to date and we thank all members for their prompt attendance to this. A gentle reminder though that the 2015-2016 membership will be due on June 30th, and another gentle reminder to members who forgot to cover their 2014-2015 memberships. Can we try to make it a full house of dues for the coming year? The 2013-2014 AGM was held on June 24th 2014. A general meeting on August 2nd 2014 followed it. Members took turns to attend to the ‘Spring Into Gardening’ stall on October 12th. The Christmas Party was held in the Gardens on December 14 and gave us an opportunity to trial the ‘members’ photography’ competition. 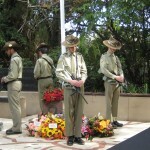 The normal quarterly meeting of April 14 was followed by the commemoration of the newly built RSL memorial in the gardens on April 18th. John Hawker produced three newsletters. Knowledge of Outlook (or equivalent) & Excel, plus very basic accounting skills. Maintain and update membership database including subscriptions paid. Maintain record of donations & expenses – plus banking. Send out reminders re unpaid member dues – when required. Prepare and deliver the financial report for AGM. Complete paperwork for Consumer Affairs. The Association’s reporting year ends 20th February. The AGM must be held within five months of this date. This is usually held in June. Attend meetings when possible – only four per year including AGM. If available (and interested), assist at Stonington’s ‘Spring into Gardening’ at the ‘Friends’ marquee, usually held in October. The current Treasurer, Jennifer, will help you learn the ropes. Time required works out to around 4 hours per month. Six members participated in the ‘trial’ Member’s Photography Competition that was ‘judged’ by Kevin Birks (recently retired from Photographic Imaging College (http://pic.org.au) with Peter Legge winning with his image of the gardens taken under the artistic direction of Jenny Legge. Members agreed that we should continue with this competition in 2015, and details will be posted by the end of the financial year. Work on the redevelopment began in January 2015 and the site completed in time for the commemorative event on April 18th. The event was well attended by members of the public, representatives of returned soldier organisations, students from local schools and Council, RSL and State and Commonwealth Parliamentary representatives. The web site has been in use for the past 12+ months and we are slowly getting used to what needs to be done to keep it up to date. Our thanks to Nic Hawker for maintaining it during its ‘teething year’ and a reminder to members to communicate directly with Vihra (vmigios@gmail.com) should they wish to have their items or feedback added to the web site. John initiated a ‘Victoria Gardens Inspection’ on Thursday 21 May 2015 with committee members and Stonnington City Council representatives with specific responsibilities for the maintenance and development of parks and gardens. Denise Saville, Vihra Migios and John Hawker joined Stonnington staff Rebecca James (arborist), Steve Watt and Glen Anderson in what turned out to be a two hour walk around the gardens identifying garden bed and other maintenance issues as well as celebrating some of the wonderful flora that make this the only truly unique heritage garden in Stonnington. The Friends are very fortunate to have a member like John Hawker who has absolutely intensive knowledge of every plant/tree in the Victoria Gardens and who also can comment with authority on its heritage values. His expertise gives the Friends the reputation for being an extremely well informed and knowledgeable community group. We anticipate that the ‘Victoria Gardens Inspection’ will become a yearly event. *All the current and past members who have made the Friends the community organisation that it is. The 2014 AGM meeting elected the following committee for a further 12 months. The FoVG meets 4 times per year. The date of each meeting is notified some weeks before the meeting is to be held and is also foreshadowed in the minutes. We began the July 2013-June 2014 year with the election of office bearers. The committee, comprising Denise Saville, Vihra Migios, and Jennifer Withecomb, was re-elected for a further 12 months and John Hawker continued to take responsibility for the Newsletter. However, Jennifer put us all on notice that this would be her final year as treasurer and that she would not stand for office for the 2014-2015 year. We made a very conscious effort to align our meetings with the financial year and advised members that membership fees would also be due on July 1st. We trust that the Direct Debit facility makes it easier to keep membership up to date and we thank all members for their prompt attendance to this. Our 2012-2013 AGM was held on June 18th and was followed by a general meeting on August 27th. The ‘Spring Into Gardening’ stall on October 13th was followed by our Christmas Party and launch of the web site (http://fovg.org.au) on December 8th. We held an extraordinary meeting on December 10th and held a normal meeting March 25th. John Hawker produced three newsletters and the contrast between the wet in 2013 and the dry in 2014 is rather telling. The above is a rather dry summary of what has been a most eventful year. 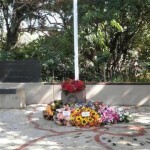 Early in 2013, Stonnington City Council (SCC) advised us that the Prahran RSL was interested in improvements to the RSL this as the current memorial, first introduced into the gardens in the 1950s, had become degraded over time. We were also given to understand that SCC had accepted a ‘gift’ of a statue from the Bruce Steel Kingsbury Society, and was inviting us to show where in the gardens such a statue could be erected. SCC staff attended our August 27th meeting to present the draft proposal for the redeveloped RSL site. Members made very constructive suggestions to the designer of the redevelopment. Passions flared when it came to discussing the request for the erection of a statue as a separate item to the RSL redevelopment. The FoVG members agreed to keep an open mind and to reserve our decision until the full designs were presented. We held an extraordinary meeting on December 10th on the understanding that we would be finalising our response to the two proposals: i.e. the RSL redevelopment and the possible erection of the Bruce Kingsbury Society’s statue in the gardens. having spent considerable time walking the gardens, and given that this statue was to be ‘life size’ on a 600-900mm pedestal (very sketchy information and only one image of a ‘maquette’ of the proposed statue had been provided), we could not see how it could be erected in the gardens and do justice to the sculptor or the sculpture, or for that matter to the Victoria Cross recipient it sought to commemorate. The FoVG wrote to SCC to advise that there was no suitable place in the gardens where such a statue could be erected and suggested that Council seek an alternative garden, one with the open space to do it justice. FoVG members expressed support for the redevelopment design and wrote to SCC and the RSL commending the design. Imagine our surprise when in January 2014 we received a response from SCC informing us for the first time that Council had already long ago decided that the statue be erected in Victoria Gardens, and that all that was required was for the FoVG to say where in the gardens this was to occur. FoVG was again invited to attend a meeting (March 2014) in the gardens to determine where it could be located, and it was then that we finally received the information that the SCC had made its unilateral decision to erect the statue in VG in 2011! As it transpired, neither the FoVG nor the Prahran RSL had been consulted at the time and the recommendation to erect this statue in the VG had been made entirely by SCC staff. But wait, there is more! Our March 2014 meeting dealt almost entirely with the decision by SCC to not only make unilateral decisions, but to also withhold this vital information from the consultative process that we had entered into in good faith. In addition we objected to the ‘go between’ nature of their consultative process, and to the large memorial footprint that the imposition of such a statue would create. Our objections were documented and sent directly to the SCC CEO. We requested a new meeting, this time with the RSL and other stakeholders in attendance. SCC finally held a meeting of all the stakeholders on May 27th. This meeting included the representative from the Bruce Kingsbury Society and the sculptor as well as SCC departmental heads. The Prahran RSL voiced their strong opposition to the abstraction that was to be the statue and to the process that had totally excluded them to date. The RSL had understood it to be a statue of Bruce Kingsbury VC (likeness) and not a statue commemorating Bruce Kingsbury VC (an abstract form). They objected most strenuously to the proposed statue being located in Victoria Gardens. FoVG reiterated our opposition to the erection of a statue, not only because of its size and lack of clear space for such, but also as a separate entity to the RSL redevelopment. We also requested that the proposed RSL redevelopment site be clearly outlined prior to commencement of excavation/construction works so that its proposed footprint can be gauged more accurately. Simon Thomas, City Works General Manager, undertook to communicate our strongly expressed objections in his report to SCC. The lack of coordination at the SCC end was apparent and it is clear that there are issues that can only be resolved between the SCC and the Kingsbury Society. And given the clear positions taken by the Prahran RSL and the FoVG, the Victoria Gardens are not to be used to resolve these issues. All in all it has been a most eventful year! Thank you again to Denise, Jennifer, and John for their invaluable work throughout the year, and to Nobby for being such a great host of FoVG meetings. Thanks also to our members for continuing to show an interest in and concern for the beautiful Victoria Gardens. The 2013 AGM meeting elected the following committee for a further 12 months. The FoVG meets 4 times per year. We began our 26th year with a successful call to members to fill the vacancies created by the resignation of John Hawker as President (15 years in office) and Nobby Seymour (Public Officer). A new committee was elected at the 2012 AGM with Vihra Migios agreeing to the presidency on the understanding that John would continue his role as the FoVG horticulture expert and editor of the newsletter. Denise Saville took on the role of secretary, whilst Jennifer Withecomb remained as treasurer for another year, and will hopefully continue in this role. The dedication of the former committee members was recognised with a hearty round of applause. The 2012 AGM was followed by the October 14th Spring Into Gardening event. Our stall was tucked behind the weeping Lilly Pilly and to the right of the Murray Street gates. Given the enclosed space it was hard to gauge the actual numbers who attended this event, but Council assured us that the numbers were up to expectation. We would like to thank the members who hosted the stall. We signed up 11 new memberships and welcomed 20 new members to our midst. The second meeting was on Tuesday November 13th. We continued to discuss John Hawker’s proposal for the creation of a web page containing a guide to the Victoria Gardens. We also finalised the details for the forthcoming Christmas Party to be held in December. Thank you Lisa Wells for creating a funky invitation. Our Christmas Party was held on Sunday December 9th. A highlight of this event (apart from the meet and greet of new and current members) was the guided walk around the garden led by John Hawker. All who followed him around appreciated his extensive knowledge and willingness to share this with us. I accepted an invitation to attend the Christmas Party of the Prahran Garden Club. This invitation has led to a discussion of the merits of creating closer links with this organisation. The members meet (and pot) within the gardener’s enclosure in the Victoria Gardens. 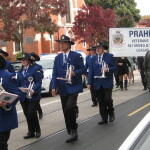 The Prahran RSL is another community group with strong ties to the Victoria Gardens. The RSL is negotiating with Council over the long-term improvement of their commemorative site. In the short term, the gardeners planted ‘Rosemary’ and generally improved the appearance of the site in time for the 2013 Anzac commemorations. The proposal to investigate the erection of a shade cloth over the Lumley Playground has been shelved. Unfortunately the FoGV committee members are no longer users of this playground so find it difficult to gauge user opinion. Perhaps FoVG member families who regularly use this playground during the summer months might like to take this up as a conversation starter with other users and gauge interest in developing such a proposal to go to one of our meetings? We met again on April 16th. The April 2013 newsletter was again produced by John Hawker and included information about the removal of trees and notes on some of the new plantings. Agenda items at this meeting included the proposed web site and the confirmation of the membership year. The latter has been set as being a ‘financial year’ membership with all memberships due again as of July 1st 2013. This would bring membership dues into line with the AGM. The proposed web site scope of project was discussed and agreement reached to invite graphic artist and web page designer Nick Hawker to give us costing for such an endeavour. Nick was responsible for creating the Prahran Historical and Arts Society web page, http://phas.org.au/. He comes highly recommended by Nobby. We will finalise the details of this project at our next meeting on June 18th, and also fulfil the requirements of the AGM format. To all our new and returning members, welcome to the 26th year of the Friends.